Has it become difficult to open a jar, turn a door knob or button buttons? Do you have pain at the base of your thumb that makes daily activities difficult or prevents you from getting a good night sleep? This may be caused by a common form of hand arthritis referred to as carpometacarpal (CMC) joint, which is the thumb joint nearest the palm. This joint allows our thumbs to swivel, pinch, pivot and grasp objects with our hands. 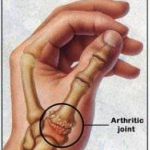 CMC joint arthritis is found to 5-10 times more common in women than men, in individuals over the age of 40 and if you had a previous injury to the thumb such as a fracture or dislocation. Osteoarthritis causes the cartilage to wear away, the shock and impact absorbing function of the cartilage is lost and the bones can rub against each other, causing stiffness, pain, deformity and eventually a loss of hand function. Some of the symptoms that signal thumb arthritis include pain with activities that involve gripping or pinching, swelling and tenderness at the base of the thumb, and an aching discomfort after prolonged use. The joint also may appear enlarged or develop a bony prominence or bump over the joint, with limited motion. Timely treatment is important. Initially symptoms can be managed conservatively with the use of over the counter anti-inflammatory medications, heat, topical creams and with soft or rigid splints. 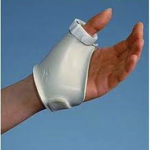 A splint positions the thumb to assist in decreasing a deformity and provides stability to assist in pain relief and improved functional use. However, if splints are not helpful or become ineffective a consultation with a hand surgeon would be appropriate. Following the hand evaluation, a steroid injection into the joint may be offered as a treatment option to assist with pain relief. When conservative treatment is no longer helpful surgery is an option. The “gold standard” surgery for CMC joint arthritis is called a ligament reconstruction and tendon interposition (LRTI) surgery. The arthritic bone is removed and the space is maintained with soft tissue. Surgery is performed on an outpatient basis. Most patients wear a cast for 2 weeks followed by a removable splint for 4 weeks. Generally Occupational /Hand Therapy is ordered to assist with regaining motion with respect to the healing joint replacement.